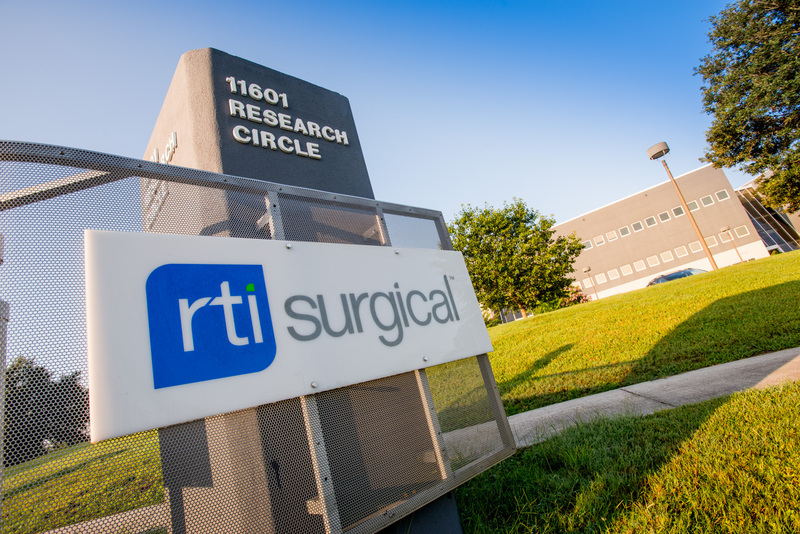 RTI Surgical® Continues to Augment Leadership Team to Accelerate its Strategic Direction - RTI Surgical Holdings, Inc.
ALACHUA, Fla. (September 18, 2017) – RTI Surgical Inc. (RTI) (Nasdaq: RTIX), a leading global surgical implant company, announced today three new appointments to its senior leadership team to accelerate the Company’s strategic growth initiatives. They include Jonathon Singer, a member of RTI’s board of directors, as Chief Financial and Administrative Officer, effective October 2, 2017. Outgoing CFO Robert Jordheim will leave the company to pursue new endeavors following a successful transition. RTI also appointed Olivier Visa, formerly Vice President of Global Compounding for Baxter, and Julius Aviza, past Vice President of Global Quality at American Medical Systems, to lead its OEM, Donor Services, Sports business and quality assurance function, respectively. The new management additions demonstrate another important step toward positioning RTI for continued progress in executing its strategic transformation plan. The augmented leadership team has decades of highly specialized functional and industry expertise, along with a diverse skill set that is aligned to build on RTI’s recent strong performance and to advance its progress toward returning RTI to long-term sustainable growth and profitability. Each leader will play a critical role in further developing their respective functional excellence, streamlining RTI’s businesses, upgrading its processes and reinforcing a culture that is laser focused on the customer. Mr. Singer, an RTI board member since May 2016, will resign from the board to focus on his new role, which includes managing the company’s financial operations and overseeing RTI’s information technology, legal and business development functions. He will report to RTI Chief Executive Officer Camille Farhat. Mr. Singer has more than 30 years of leadership experience at publicly-traded health care and pharmaceutical organizations. Previously, he was Executive Vice President and Chief Financial Officer at Sagent Pharmaceuticals, a producer of generic injectable products that won numerous awards for growth and innovation during his tenure. Mr. Singer also served as CFO of Landauer, a radiation safety products and services provider, and as Vice President for Global Finance and CFO of the Medical Segment at specialty medical device company, Teleflex. A certified public accountant, he has held finance, accounting and operations roles at Cardinal Health, R.R. Donnelley & Sons and KPMG. Further building out its management team, RTI appointed Olivier Visa as its President of OEM, Donor Services and Sports, and Julius Aviza to the role of Vice President, Global Quality Assurance. Mr. Visa has 25 years of commercial leadership experience in the global health care industry, with a focus on transforming businesses and building sustainable value. He joins RTI from Baxter Healthcare Corporation, where he was Vice President of Global Compounding, responsible for overseeing global profitability improvement of the outsourcing pharmacy business and ensuring that operations, quality and research and development focused on patient safety and innovation. Mr. Visa succeeds Roger Rose, President of Donor Services and OEM, who is leaving RTI to seek new opportunities. Mr. Aviza, who previously was Vice President of Global Quality at American Medical Systems (AMS), has over 20 years of global Quality Assurance and leadership experience focused on building and implementing scalable quality systems. His expertise spans the medical devices sector, across new product development, sustaining engineering and operations. He has a track record of resolving quality and compliance issues and driving organizational effectiveness for multiple medical device companies including AMS, Allergan, GE Healthcare, Baxter and Abbott Laboratories. Mr. Aviza succeeds Bryan Martin, Vice President of Quality, who is leaving RTI to pursue other opportunities. RTI continues to augment its leadership team having recently announced the appointments of Paul Montague as Vice President, Human Resources and Enrico Sangiorgio as Vice President & General Manager, International Markets. RTI is also recruiting for top research and development positions.